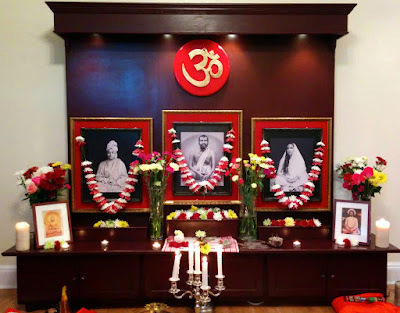 Welcome to the Vedanta Center of Greater Austin. The Vedanta Center is a community for spiritual aspirants. Its mission is to provide a conducive environment for seekers of self fulfillment following Vedanta philosophy. Drawing inspiration from the practical and modern interpretation of Vedanta by Swami Vivekananda, the Center considers service of humanity and active participation in addressing social issues such as healthcare, education and natural disaster relief to be integral parts of its mission. We provide opportunities for seekers to pursue spiritual growth through prayer, meditation, worship, service activities, study of spiritual and philosophical literature and gaining exposure to practical Vedanta from monks and nuns associated with the Ramakrishna movement as well as others. Please do not park cars on the lawn around the center. Cars could be parked at one of the center drive ways (13506/ 13508) or at Forest North Elementary School parking lot right behind the center. Thanks in advance for your cooperation, help and support!